Midnight Show comes back for the fourth time to beguile the audience of New Horizons festival with a phantom of an exhibition. We must warn you though, this time it's not a performer lurking in the darkness, nor the gathering of people and artefacts we've called at midnight in previous years. We're leaving the Dizajn BWA Wroclaw gallery, our usual stage of Midnight Shows, and moving the action to the yard of the house on Ruska st. 46A/13, where we'll have a seance without screening a movie. We've engaged 99 authors who have prepared 99 works in 9 episodes. Starting time remains the same. We invite you 9 times, every time for an hour at midnight. Midnight Show was created in 2013 as a project carried out by the Dizajn BWA Wrocław gallery within the framework of T-Mobile New Horizons International Film Festival. The first Midnight Show tested whether the exhibition medium can withstand the formula of a cinematographic-like seance. Midnight Show had a strictly specified beginning and end. It appeared and disappeared. It opened at midnight and closed at 1:00 AM, in order to reopen again the following night. It changed with time, every hour, or rather overnight, the action of the exhibition went forward. Midnight Show was thought as an additional screening within the New Horizons festival that would start after all the other screenings have ended. The topic of Midnight Show is the beginning and the end. The passage of time between the former and the latter. The shadow of the cinema cast on art. A cinematographic experience of the presence of non-moving pictures, an inanimate artefact and, last but not least, the audience. 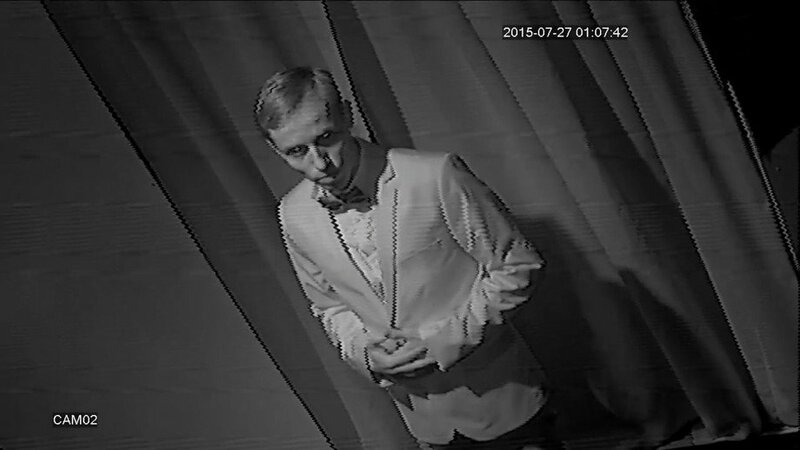 In 2014, we prepared a sequel of the first exhibition, Midnight Show II, enriched with the ghost bar Cafe Cioran created by Michał Frydrych - a pub where instead of money you paid with bad luck and a place you could not re-enter after leaving. One year later we opened Midnight Show III: Taken. This time we plunged the gallery, the artworks and the audience into complete darkness. The phantom-exhibition changed into an invisible one. Until now we tried to take viewers to the show. This time we propose a show that the viewers can take away with them. This exhibition is bigger than any of the previous Midnight Shows, because #paperismorepatient. The objects you will be able to find there are unthinkable in a gallery and in the real world, because #paperismorepatient. Among the 99 invited participants there are visual artists, musicians, film makers, writers and curators. Many of them participated in previous editions of Midnight Show. Many are current or former participants of New Horizons. All of them are artists whom we admire. We asked each of them for one work - one page - one moment - Midnight Show. The time of Midnight Show remains the same. The exhibition has been divided into 9 parts on paper. Each of them appears at midnight and is available during 60 minutes. 23 hours later we invite you for the next part. The time you will spend later on with Midnight Show depends on you.